2019 – new year, new ideas, new perspectives. There will be some retreads and updates of oldies but goodies in everyone’s practice. And we can predict there will be a comeback for some of the repeatedly discredited same old same olds. There are ideas and mantras that keep turning up like uninvited guests. They have no right returning to muddy educational waters. With the excellent ideas, resources and support available to us we can all be strongly on our guard against those ‘quick fixes’ and ‘easy steps’ to apparent literacy ‘success’ for our students. We can be sure that we are the experts on our own students, as we get to know them, work with them and build their skills, knowledge and understandings. The relationships we can establish and build with each student is the most important element of each child’s year in our class. We have authoritative, knowledgeable and experienced colleagues available to us in all aspects of our practice. Resources available to us have been described and explained in previous blogs on this site. Look them up and use them. We build our confidence and expertise by using our own strengths, building our knowledge, and drawing on the exceptional skills and knowledge of our colleagues. If we have a question or an issue, and don’t know the answer, we can be sure that other teachers have had the same issue, and out there somewhere is an answer that will be appropriate for us and our students. For my own new year there have been a few personal ‘firsts’, including a fabulous trip to New Zealand, a couple of helicopter rides with a few white knuckle moments, and striding and climbing on Fox Glacier and being amazed at the earth making itself. I visited Türanga, the main Christchurch library. It was opened following major relocation and rebuilding in October 2018 and incorporates the amazing Imagination Station. The facility shows us what a library can be when there is thought and careful planning and knowledge of the needs of children and their parents – and a fair amount of money too. The features were the spaces available for everyone – room to leave the prams, fill the drink bottle, have a quiet time with a child, and select and read a book.. The facilities were excellent, and could easily be replicated with careful creativity. 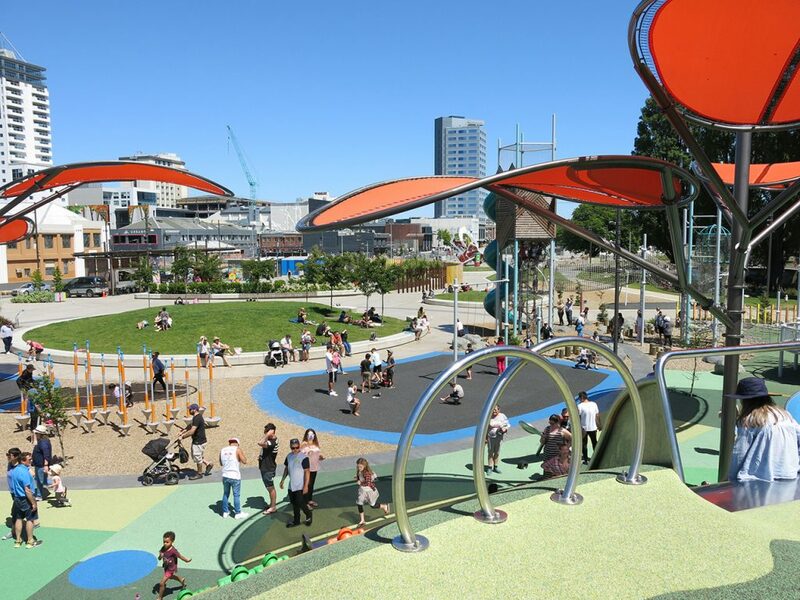 The Margaret Mahy playground in Christchurch is another of amazing play spaces for children and their parents. Margaret Mahy (pronounced Mah-hee) was a prolific author for children, and a passionate advocate for children. Her works are many and varied, and well worth chasing up. I read ‘Pillycock’s Shop’ to my own children many years ago, and it raised many issues of responsibility and duty of care that we were able to discuss in that distance provided by literature. Check out ‘Why reading aloud to older students is valuable’ in KQED News. It is so good to see the Australian authors of children’s books being recognised by Australia Post. Check out Leigh Hobbs and his amazing Mr. Chicken – kids love this crazy creature and his adventures. Leigh Hobbs speaks about his process and intent here. Morris Gleitzman, Alison Lester, Shaun Tan Mem Fox join Leigh Hobbs. They are legends. Do you know, Australia publishes more children’s books per head of population than any other country. Celebrate this amazing achievement with your students. Just think about how the world has altered since 2016 … fires, floods, famines and fake news. Trump, Brexit, you name it, all the things we thought we could depend on were thrown up in the air; and unparalleled and unimaginable change affected all our lives. The good news, is that the build-up to this year’s transit brings potential for more honest communication and a sense of relief; as hidden agendas become clearer and new bonds of trust are nurtured. The new year also brings a chance to explore what we once thought impossible. Jupiter’s relationship with the visionary dreaminess of Neptune represents a real opportunity to grow into roles we might envisage for ourselves but have never had the confidence to inhabit fully. Yes, there needs to be a focus in our work on the evidence of research. But it is always good to have some optimism to begin. If ‘the stars’ are aligned, make the most of it.